Looking for meeting room rental space in Denver? Our conference space rentals are professional, flexible and available to rent on an hourly basis. Whether you are holding a seminar for 30 people, brainstorming with your team of 6, or meeting one-on-one with a potential client in a private office setting, one of our 10 DTC conference room rentals is the perfect space for you. Impress your guests by meeting in one of our executive boardrooms with fabulous mountain views or our smaller six-person conference room with television projection for your presentation. Click below to reserve the meeting room that is right for you. Why choose us for your Denver meeting space or conference room rental? We offer more than just meeting room rentals. Let Executive Business Centers be your virtual or full-time office provider! We have a variety of programs and offices to fit your virtual or full-time office needs. Simply e-mail us or call at (303) 228-2280 to book your reservation today! Meeting venues across downtown Denver and the Denver Tech Center come in many shapes and sizes. You might not need a space the size of the Colorado Convention Center or Union Station, so we have the right-sized solution just for you. We offer meeting space for small or large groups, private day offices, special events, and training rooms. Executive Business Centers is designed to be flexible and can accommodate your last minute meetings as well. Just book on-line or call us to reserve the perfect room for you in the Denver Tech Center. 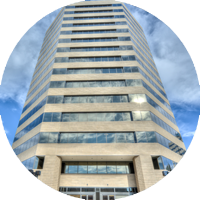 Your next Denver, Colorado event could be held at our meeting venues conveniently located in the Denver Tech Center, easily accessed from the Cherry Creek area. We have many Denver event success stories to share with you. Denver, CO is a fast-growing and dynamic city and many businesses have outgrown their current office space or would like a more convenient place to meet their clients. The strategic location of Executive Business Centers at I-25 and I-225 with free parking is the perfect answer offering meeting rooms and private offices of various sizes on an hourly or daily basis. Just call or book online to schedule a meeting space in the Denver Tech Center.